Howdy, update from Camp Buck Toms. First day of summer camp here in Tennessee has gone very well. All of the boys are enjoying themselves and camp! 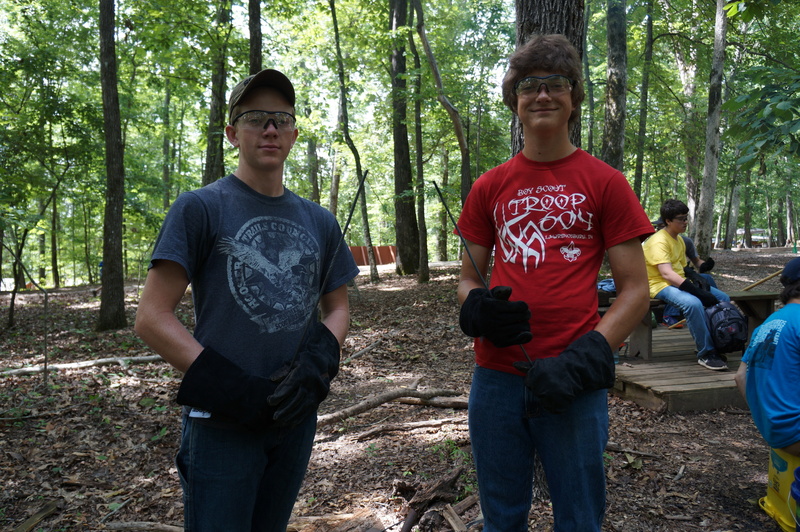 Some boys are enjoying climbing, shotgun, metalworking, horsemanship one thing is for sure everybody is loving the cabins! Tom (at right) and CJ enjoying metalworking. I asked Tommy a few questions about his camping experience and here are his responses. Tommy’s favorite part of the day was while he was in environmental science and he got to make his own Eco-system he likes environmental science since it is a hands on class. Tommy came to Camp Buck Toms to see how the camp has changed and try to remember the good experience we had in 2012. Tommy is looking forward to his metal working merit badge so he can shape some metal and try to create a useful tool. Tommy is a life scout working towards achieving his Eagle Scout award and wants to use this week here at Camp Buck Toms get closer to achieving that goal. The weather has been good so far it was hot and sunny yesterday and today it was humid and overcast. The food has not been that great hopefully it will improve as the week goes on. We had game night tonight and scout leader dinner which they enjoyed since the menu consisted of big steaks. The younger boys are busily working and gaining new merit badges. The favorite location on camp is the trading post where every body can get their sugar buzz.